Not a Bucket List But a . . . Watching Larry Wilmore the other night, he referred to Barack Obama’s last year as President as a period during which the President seems less concerned with his Bucket List than his (2 words that rhyme with Bucket) List. This is a family blog and so I’m not going to spell out what I’m talking about but we could call it the @*#^ -It List. 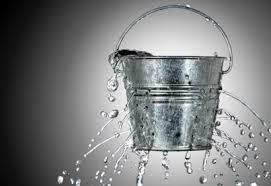 The notion of a Bucket List has always bothered me. Bucket Lists seem to create more obligations and competition than necessary. Instead, a more spiritual plan seems to be the @*#^-It List. Again, I don’t mean to be vulgar. It’s just that shedding burdens or fears or shame or unrealistic expectations seems to be a holy endeavor. Tossing out what we no longer need feels wonderful. As we celebrate a wedding in our backyard in a mere 23 days, I am in the perfect frame of mind to embrace this spiritual practice. What is truly necessary? What is truly helpful? What brings people together and what brings unnecessary anxiety. What needs to be on our @*#^-It List? Fear, inadequacy, feeling valueless, habits and mores we absorbed from our families of origin. This is one of my very favorite blog posts you have written! I love the *&^(*& List idea. That’s my kind of girl!